To explain his research in hydrogels, Stanford materials scientist Eric Appel puts things in simple terms: “Sometimes I tell people I make fancy Jell-O,” he says. In fact, modern life abounds with hydrogels, materials with varying degrees of stiffness and porosity that behave like solids even as they hold and absorb vast amounts of water. Such gels enable everything from the shape-holding curve of soft contact lenses to the super-absorbency of disposable diapers. Appel’s lab generally focuses on their use in drug encapsulation. But hydrogels can be costly and difficult to make, and in some cases they present environmental concerns. 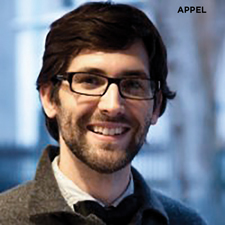 By combining two abundant natural materials, including a plant-based polymer, Appel’s lab created a new hydrogel that is so simple to make, the team mixed up batches of it using a bucket and a barbecue spatula. The result is a nontoxic, biodegradable, moldable and sprayable material that is inexpensive to scale, easy to dispose of and eminently versatile. Early tests show the new material’s potential for practical applications, from clearing pipes at wineries to improving the forest-fire retardants used in airdrops. As wineries transfer wine from vats to barrels, about 2 percent of the product remains in the pipeline until it’s flushed away—a loss of water and wine. Appel’s lab showed its new hydrogel could ooze through the mazes of pipes and valves to push the wine out. Because the gel and wine don’t mix—and because the gel’s tasteless, odorless ingredients are food-grade—the result is a windfall for the winery. Meanwhile, certain forest-fire retardants used in airdrops contain chemicals that contaminate the groundwater, Appel says. His team mixed its new gel with a common fire retardant and found that the mixture coated burnable materials longer, could be dropped from greater heights and made the retardant more resistant to being washed away. “This paper solves real-world problems,” wrote Craig Hawker, co-director of the Materials Research Lab at the University of California, Santa Barbara, and one of the peer reviewers of Appel’s paper describing the development and application of the new hydrogel in the December Proceedings of the National Academy of Sciences.